Ryan does the goal song chant with a friend at a in April, 2013. Friday was a bit of a debacle in our house. We were already over-scheduled, with games and appointments for both kids, topped off by a Devils home game. Veronica had everything timed to the minute, managing both kids’ schedules with a plan that would get them to the Prudential Center in time for puck drop. I had the easy part — meet them there on my way home from New York City. Everything looked like it would work, until it didn’t. I was a few minutes from setting out for Newark, looking forward to a pregame adult beverage at the plaza outside the arena, when I received a text from Veronica. Riley took a soccer ball off the face in her middle-school game and had a bad nosebleed. Veronica was racing to get home from a doctor’s appointment with Ryan when she received word. It was pretty clear Riley was out for the Devils game. I sprinted out of the office with just enough time to catch a train for home instead of Newark, where I could at least pick up Ryan and take him. We didn’t want two tickets to go to waste, so Veronica started sending a flurry of texts to see if a couple of Ryan’s friends might be able to go. Ryan does not have many friends but we’ve had successful outings to games with a few boys. It’s something we remind him of when he laments about the number of friends he has. A few texts later, and she had everything arranged. As I walked up the street to our house, there were three boys waiting in Devils jerseys. It was 6:30, later than I like to leave for a 7 p.m. game, but luckily the Devils had a pregame ceremony scheduled for Friday that would allow us to make it on time. More importantly, we told Ryan about it in advance to head off any worries about being late. We were fine on time — until we hit a street closure that blocked our normal route to the garage where we park. Next thing I knew, we were crawling in rush hour traffic in downtown Newark, heading away from our intended destination as the clock ticked towards 7. Ryan was nervous but I assured him we would make it for puck drop. We caught a break at the next light, doubled back to our lot, found a spot and sprint-walked for the arena a few minutes past 7. We were in our seats by 7:15, time to catch the last few minutes of the ceremony. 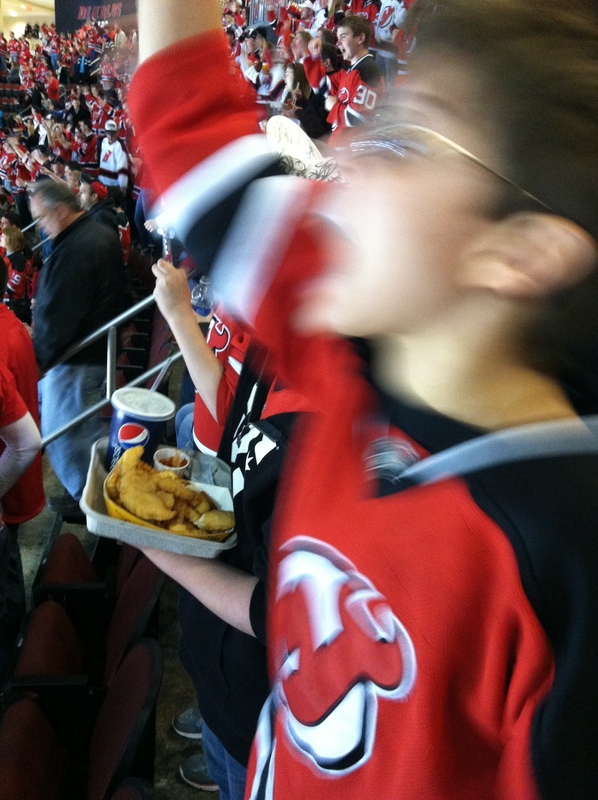 Because of the rush, Ryan had no time for dinner before the game so we planned to get food at the first intermission. I usually try to avoid buying arena food because of the cost, but this was a special occasion. But there was a problem. The large concession area directly behind our seats shut down some time during the first period due to a fire, causing a ripple effect of absurdly long lines at all the other stands. I promised Ryan to get him food, but that was before I found a 20-minute wait for pizza, and a “burger with fries” that came with chips (which he wont’ eat) instead. By the time the second period started, I still hadn’t returned with any food. I went back to the seats to reassure him and then headed out again. The period was almost half over before I returned with the only thing I could find that he would eat and that wasn’t at the end of another impossibly long line: a plate of fries. The whole experience annoyed me and I was in a pretty sour mood as I sat down to watch the rest of the second period. Then I looked over at Ryan, interacting with his two friends. I asked him if he was enjoying the game, and his answer pretty much made everything that happened the past few hours irrelevant. Thanks for putting everything into perspective, kid. They sure do. Thanks for reading!